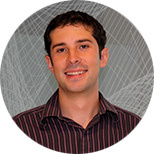 Andrés Vecino-Ortiz joined the Post-Graduate Fellowship program in 2010 and worked with two research teams while at IHME: Cost Effectiveness and Health Service Delivery Constraints. With the Cost Effectiveness research team, his work focused on providing policymakers with tools for designing and choosing the best interventions to improve health outcomes. The research with the Health Service Delivery Constraints team involved evaluating the health component of several ongoing social programs. Upon completion of his fellowship, Dr. Vecino-Ortiz enrolled in the PhD program in Health Systems at the Johns Hopkins Bloomberg School of Public Health. Trujillo AJ, Vecino-Ortiz AI, Ruiz F, Steinhardt L. Health insurance doesn’t seem to discourage prevention among diabetes patients in Colombia. Health Affairs. 2010; 29(12):2180-2188. Vecino-Ortiz AI. Determinants of demand for antenatal care in Colombia. Health Policy. 2008; 86(2-3):363-372. Vecino-Ortiz AI. Accuracy in death certificates at Instituto Nacional de Cancerología, Colombia. Revista Colombiana de Cancerología. 2006; 10(3):170-182. Spanish.